4:30 Tuesday morning and I’m barely awake. My alarm had only gone off seventeen minutes earlier. I shrug. No one really should care where we leave a car at this hour. It hasn’t snowed in a while, and it is not expected to. No snowplows except for this one will be mad that I park on the street for a few hours. Even today, they are just moving around old piles from the public parking lot. We park elsewhere, and are on the road toward the park entrance. 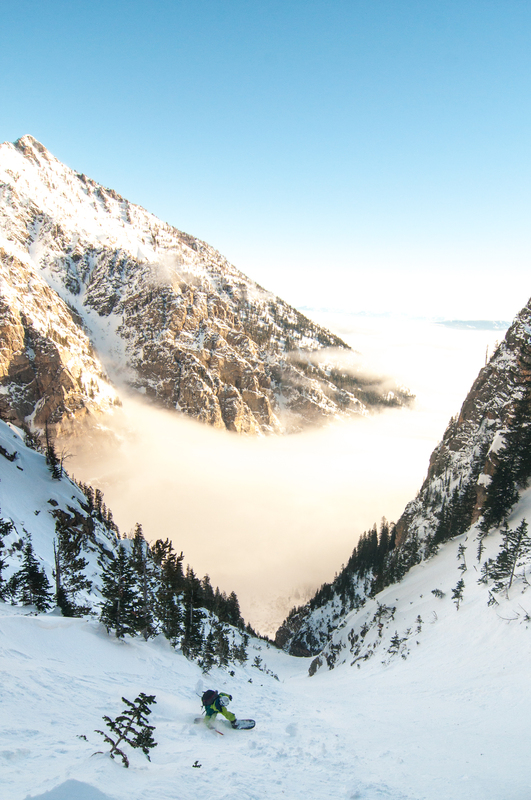 The idea is to take a look at Son of Apocalypse, an aesthetic couloir tucked into a north-facing cleft on Prospector’s Mountain. Though it is overshadowed by its big brother (err… father), the Apocalypse Couloir, the Son provides a quick (relative) getaway into couloirland, hence our presence this morning. Taylor had to be to work by one pm, so we got our start in the darkness. 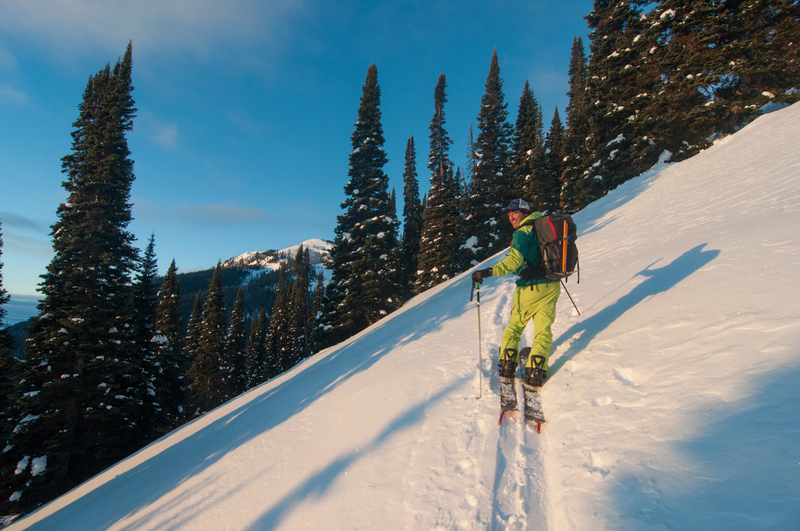 With a time constraint, we chose to take a familiar route, one that I had skied a couple of times. That didn’t stop me from cruising the wrong way down the exit track when we got toward the bottom of Death Canyon. 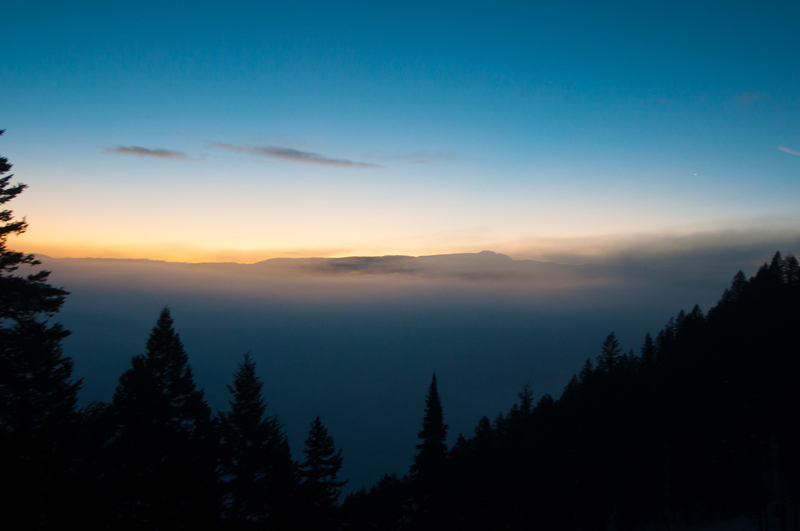 That only put us a few minutes behind, and we were skinning up out of the morning mist into the sunrise before we knew it. Rewind to last season. 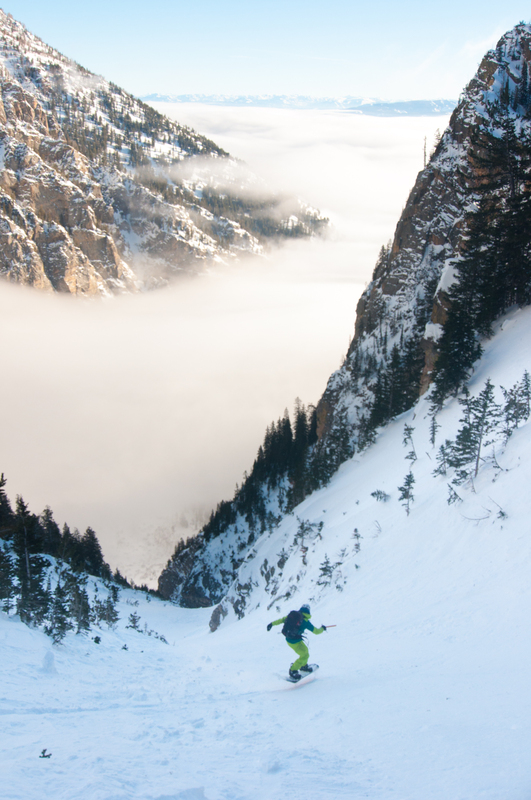 The first time I skied this route was last season with Aaron Nydam. 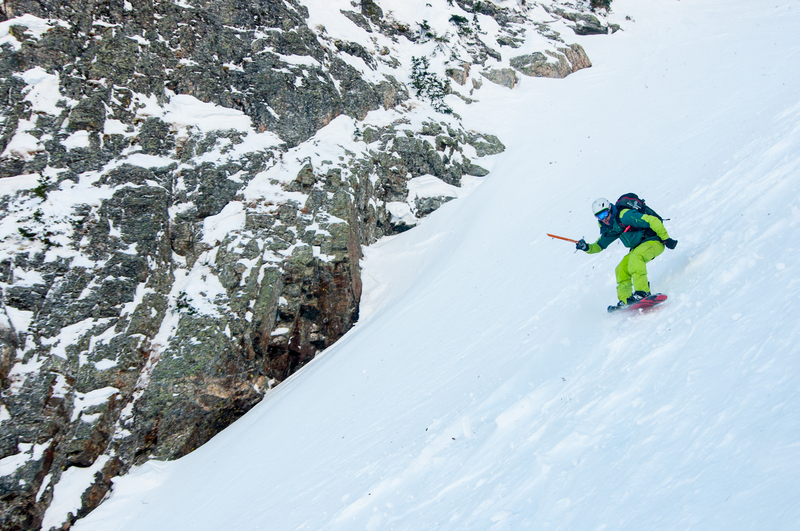 Knowing that protected North facing routes were still holding good soft snow, we headed toward Death Canyon, hoping we’d be able to combine ascents and descents of the V Couloir and the Son of Apocalypse. We trenched our way up the apron of the V, which had sloughed in extra deep in the last storm cycle. 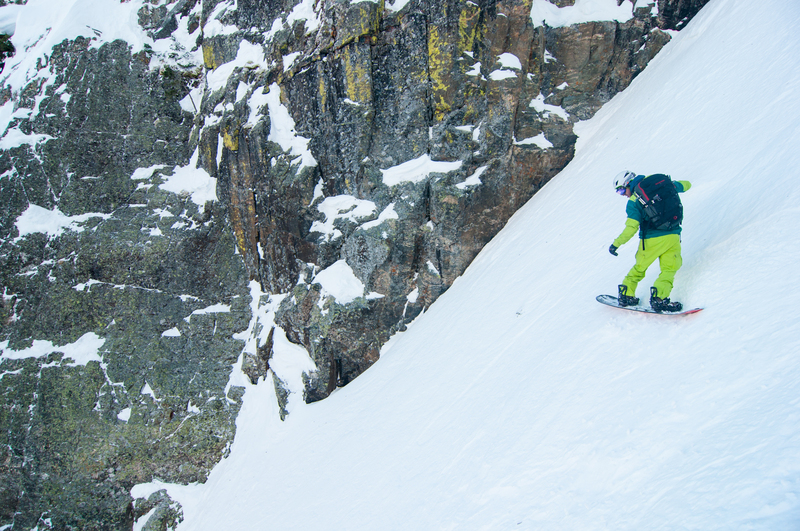 Aaron had to be home to take care of kiddos, so we hit our turnaround time before making it too far up the couloir. Despite this, we still had the full length of the Son to ski. Coming in from the top, we took a high east facing entrance, which provided sun softened snow and a little extra vertical through an aesthetic choke. We leapfrogged down until I found myself looking down a 20-odd foot ice bulge. Hadn’t prepared for that one. Fortunately we only needed to boot back up a little bit in order to cross a small ridgeline into the main gut of Son of Apocalypse. We were definitely late. 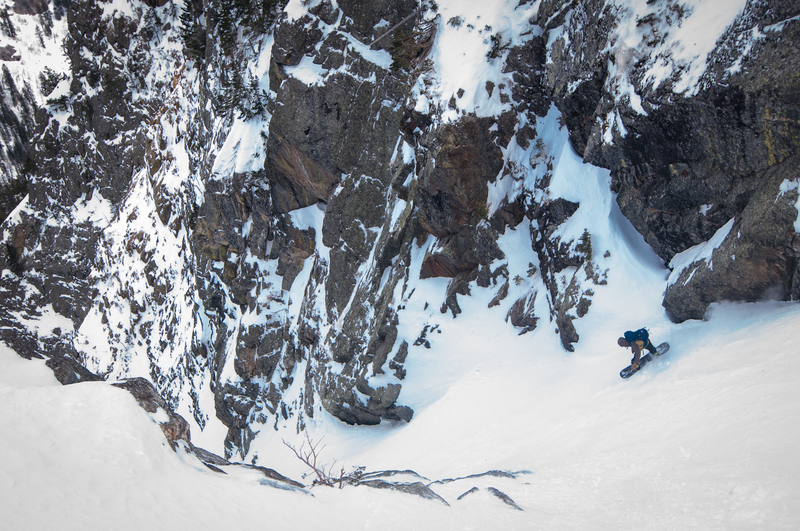 I came back the next day with another partner, promising Ben Rossetter that the V Couloir was in prime condition and that the Son of Apocalypse was still holding great snow. 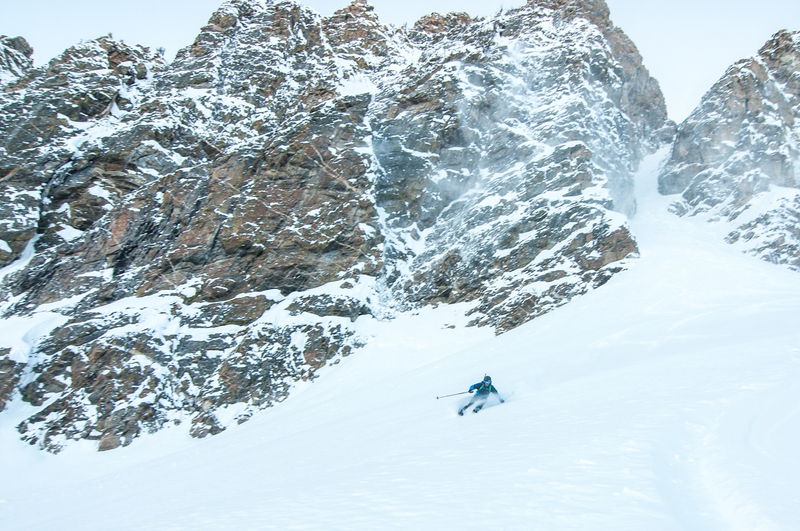 Once our non-alpine start got us in view of Prospector’s Peak, we realized a couple of skiers had already been up and down the V. In the couloir, most of the deep snow we encountered the day before had been sloughed down to the lower apron. Oh well. We climbed to the choke point, and decided that was high enough for us that day. 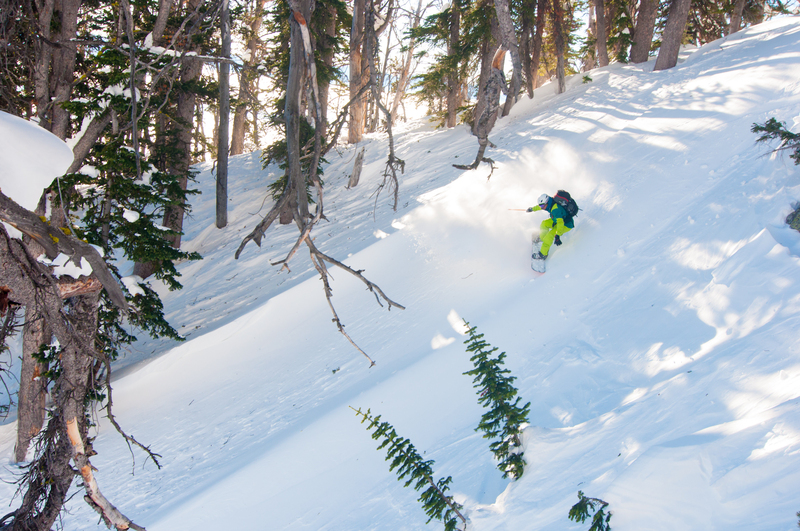 No need to deal with downclimbing narrow little things mid-ski we thought. 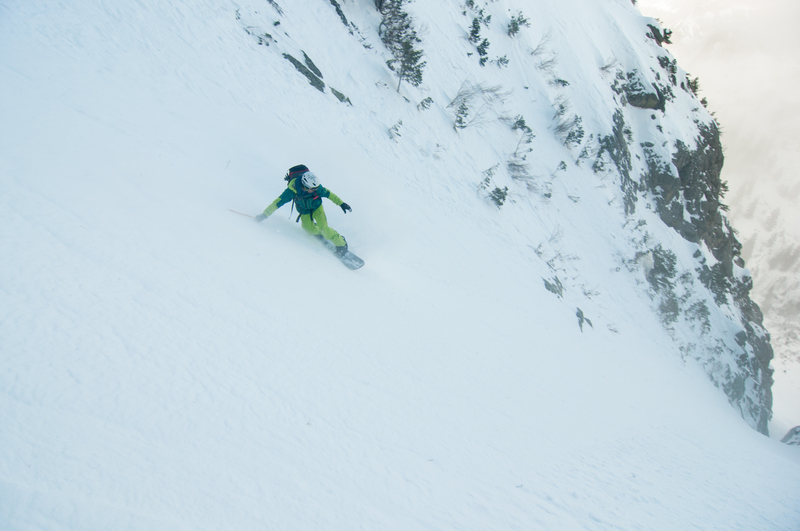 Looks like I still need to top out on that couloir. We continued on to the Son of Apocalypse, avoiding the iced out entrance that slowed Aaron and I down the day before. I was there again at the end of that week with Benja, Chiara, and their friend Ian. 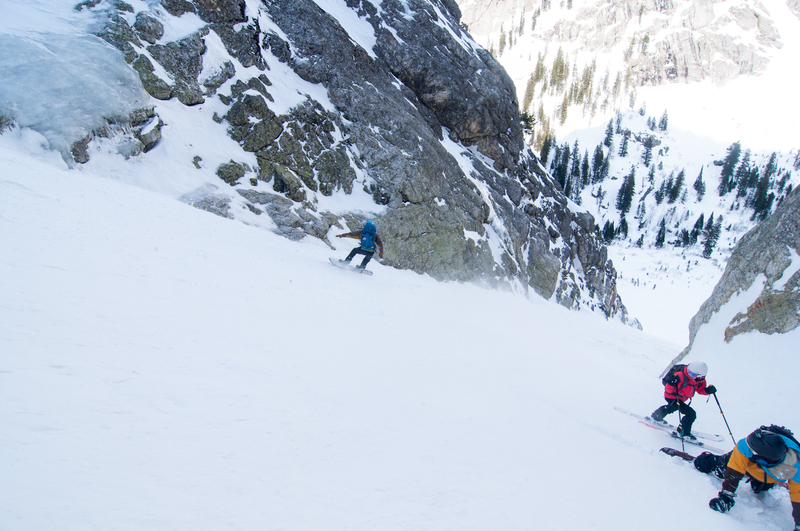 Benja wanted to “up the game” and get Chiara on something a little more challenging, as well as give his visiting buddy Ian a big Teton line to write home about. 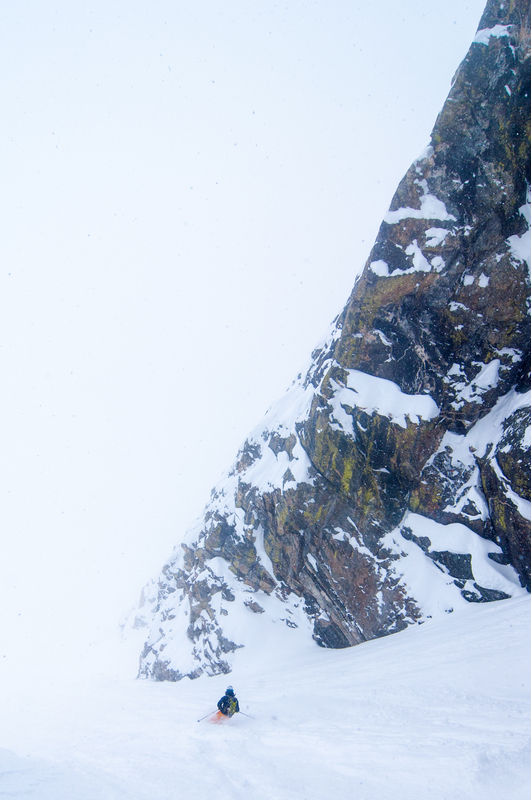 I promised Benja that the line was in great shape and Chiara and Ian would be good to go in terms of stepping up to a bigger line like that. 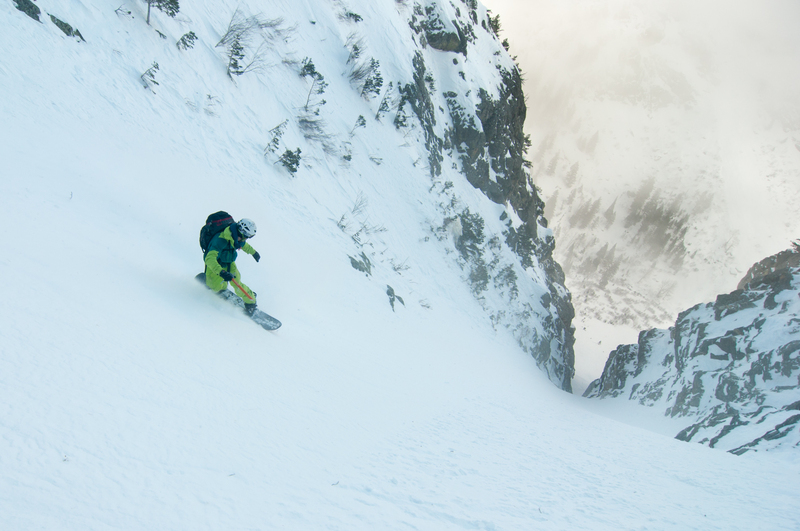 Once we started skiing the couloir, we realized it wasn’t in the great soft conditions I had promised. 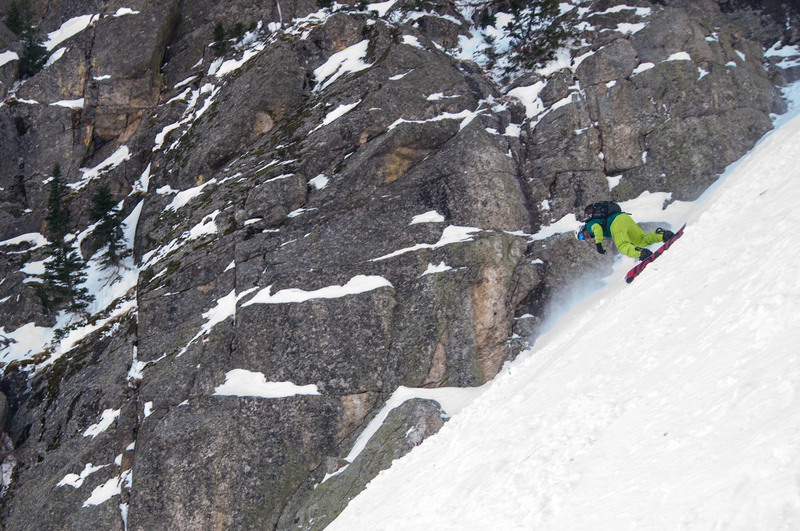 Wet slides on adjacent sunny faces had deposited down onto the couloir, making for some variable skiing and lots of chicken heads. A guided party that we had barely beat to the entrance had started skiing down as we were exiting, adding some small whizzing snowballs from above to the mix. Fast forward back to 2016. Taylor and I hoped this line would be holding some soft snow leftovers from our big storm cycle last week. And that the winds hadn’t hammered the line too hard. Our wishes did not come true. A firm, hardpacked (but consistent, at least) windbuff kept us on our toes as we descended toward the cloud layer that still lingered at the bottom of Death Canyon, on Phelps Lake, and the valley. 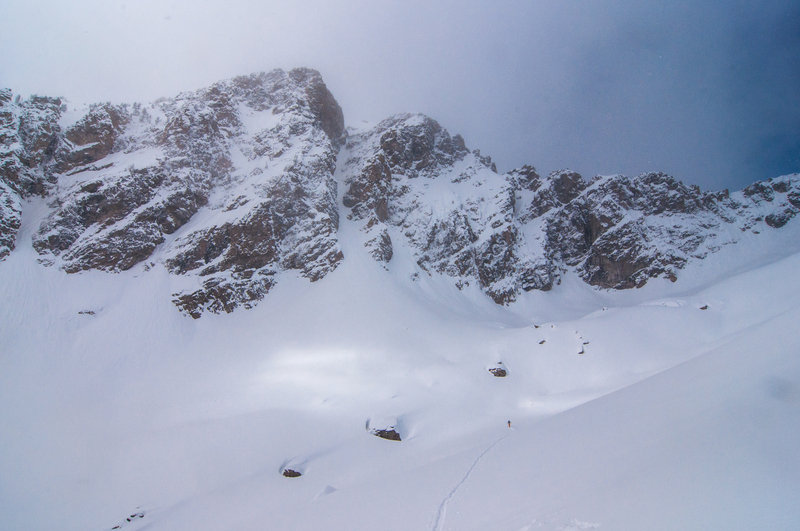 The choke at the bottom of the couloir was a little spicier than I remembered, but passable without too much trouble. We took some time to admire some surrounding ski lines (Apocalypse, Alpha, Omega, Grandson of Apocalypse (?) before making quick work of the schussing and skinning necessary to get back over the moraine and to the trailhead, reaching Taylor’s truck before 11:00. 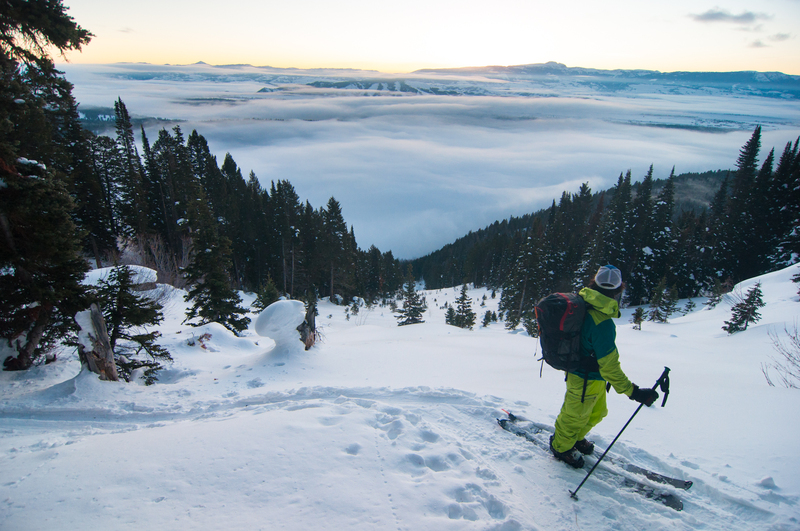 What a view to ski into! With plenty of time to spare, Taylor might have even had time for a shower before heading off to work. Not only pictures from a camera. Sometimes the camera captures video, and sometimes, there are thoughts, feelings, words, memories, ideas, and stories that the camera and/or camera operator simply cannot capture.